When contact is lost with the newly conquered worlds in the Kerme Nebula the worst is assumed. King Agesilaus sends Xenophon and Princess Kyniska with an elite force of Terrans, mercenaries and volunteers to secure the region from the clutches of the Empire. But what they find in the Nebula is the stuff of nightmares. Unspeakable horrors have engulfed the region and threaten to take back all the Terrans have won. The legacy of the sinister warlord Tissaphernes remains as his Legions of terrifying warriors appear from nowhere to take back all that they lost in the war. The rescue mission quickly turns to a desperate battle of survival. But the daemonic soldiers are not the only horror that await them. Creatures with skin as hard as the Hydra, and warriors carrying weapons that can vaporise a battalion of spatharii now prowl the darkest corners of the Nebula. The Daemon War has begun, and it threatens to bring the Terrans to their knees as they fight for freedom so far from home. 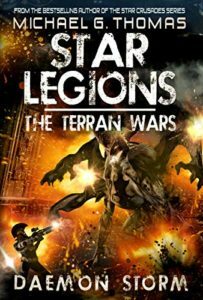 Daemon Storm is the fourth book in the ‘Star Legions: The Terran Wars’ series by Michael G. Thomas, the bestselling author of the Star Crusades series. This is the standalone sequel to the bestselling ‘Ten Thousand’ series (now available as a 7 book box set).